Thanks to one of JunkWaxGems’ contributors, we finally get to shine a spotlight on one of the most elusive Pro Set error cards not mentioning drug abuse or depicting adult content. The 1990-91 Pro Set NHL release is full of errors, many more than the outstanding amount listed in the price guides. One card has been floating around on want-lists for the last eight or so years, yet still remains uncataloged in the big guides is card number 246 depicting then Quebec Nordiques center Paul Gillis. Sharp-eyed collectors will notice that the error version lists Gillis’ jersey number as 37, as he clearly wears 23. But another, more interesting change shows Gillis’ nose bleeding on the error version while the stream of blood has been airbrushed away on the correction. This card is truly under-the-radar for most variation and Pro Set collectors but once it gets the proper exposure and eventual recognition in the guides, I can see this extremely scarce “bloody nose” variety reach levels similar to the Fred Marion “Belt” error and potentially to the Manley “Substance Abuse” error. Until proven otherwise, this is a truly rare Pro Set issue and most-certainly the rarest of it’s hockey issues. They also airbrushed away some blood on the number 23 on his right shoulder. Looks like Gillis had himself a bit of a scrap! Keeping my fingers crossed, but I may have tracked down the BORQU and a Gillis. I will keep you posted. 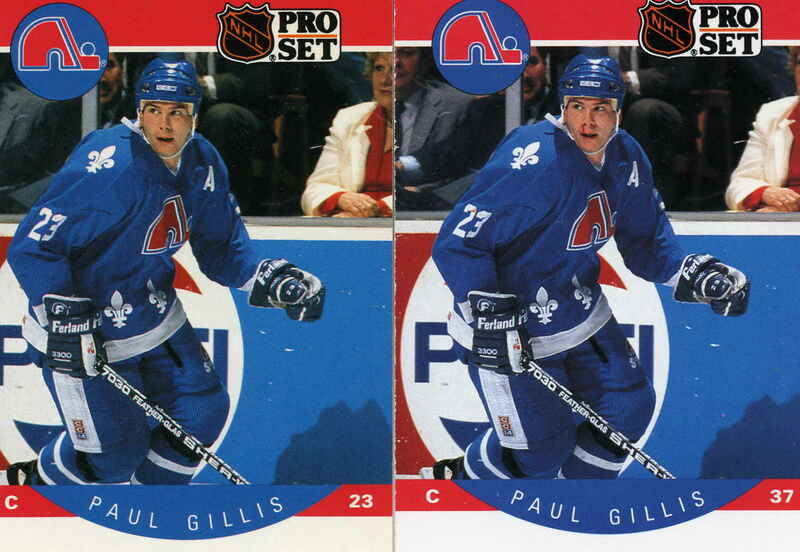 I have two of the Gillis Error cards. Do you know anybody interested? I have six of the Gillis already. For the right price I would be interested in picking up a couple more. The Fred Marion “belt” error of the 1990-91 Hockey set! These were once mythical in their scarcity but have certainly become very abundant over the last few years. Sounds like a nice hoard you’ve got there! Of the ones that I have I opened four of them out of packs. One of them that I have was the first PSA 10 that was sold on eBay. Somebody got it and traded it to me for some autographs that I had. Anyway, I’m always looking for some extras Of the Gillis. I opened up 26 cases to get my first one. No not boxes I opened 26 cases. I have all of the real error and variations with the exception of the hologram error. I need the Shawn Burr for another Master set. That’s an incredible feat! I have opened around 25-30% of what you have and did not catch a Gillis error. I did however, find one copy of the Burr error. Would you agree that the Chelios, Nilan, Housley, Hawerchuck, Savard and McCrimmon “no trade stripe” versions do not actually exist? I went so far as to make notes on every pack out of every box from every case that I opened up. Like where I got the case from, Which packs they were, which box design it had the numbers on the outside of the case that kind of thing. I figured that the window is so small for the Gillis to be made there had to be a method to the madness on where to get them out of a case. As for the validity of the others, I would say probably not. I have about two or three hundred of each of those and none of them are the mythical cards that some people are looking for. Anyone that has any gillis that they are looking to sell, I am definitely interested in it. The whole photo is shifted. Look at the lady in the white jacket, on the right side of the “bloody nose” error card. You cannot see her red shirt. The photo isn’t shifted, the corrected example is severely miscut from left-to-right.